This page provides information on various maps concerning The Elder Scrolls V: Skyrim. Skyrim Satellite Map — Our high resolution Skyrim map using the Google Maps API. Dragonborn Satellite Map — Our high resolution Solstheim map using the Google Maps API. UESP Skyrim roadmap — A simplified guide to Skyrim's many paths and tracks, as a flat image. Select locations are marked. 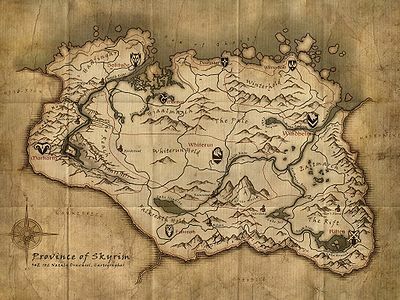 Official Prima Online Map of Skyrim — Official interactive world map. Requires purchase. On the compass and map, white locations are places you have previously visited (and therefore may fast travel to), and those in black are undiscovered. Only the icons of places you've been to or you've heard about will show up on your map. In each Longhouse or Palace used by the Jarls there is a map depicting the present political climate in Skyrim. The red icons mark the current Imperial Legion-aligned settlements and forts, while the blue flags mark Stormcloak-aligned areas. The flags are meant to update when a hold changes hands, but occasionally they do not change. Pressing "Activate" on one of these flags will show its location on your map if you haven't discovered it yet. Your current area will occasionally be shown as a blue rectangle when zooming out to the world map. Areas of the local map that were previously mapped may unmap themselves. The unmapped areas will be in rectangular shapes. This page was last modified on 13 February 2019, at 15:31.